Donald Trump’s decision to send thousands of troops to the US-Mexican border to intercept migrants who intend to apply for asylum is not just a bald-faced political stunt — it is also illegal. Passed in 1878 to end the use of federal troops in overseeing elections in the post–Civil War South, the Posse Comitatus Act forbids the use of the military to enforce domestic US laws, including immigration laws. For this reason, Trump’s decision to deploy the military to the border to enforce US immigration law against thousands of desperate migrants from Central America — who have undertaken the perilous journey over 1,000 miles through Mexico to the US border in order to apply for asylum — is an unlawful order. The illegality of Trump’s order to the military opens the door to the possibility that service members will resist it: Under the Uniform Code of Military Justice, Nuremberg Principles and Army Field Manuals, service members have a duty to obey lawful orders and a duty to disobey unlawful orders. The Trump administration had originally dubbed the military deployment as “Operation Faithful Patriot,” but it soon abandoned that name, ostensibly to downplay the law enforcement duties of the military troops. Trump’s lawyers invariably realized that using the military to enforce the laws is prohibited by the Posse Comitatus Act. Defense Department officials told The New York Times that troops deployed to the border would help construct tents and fencing and some would “potentially” operate drones on the border. Whether the drones are armed or used for surveillance, they would be assisting in the enforcement of the immigration laws. Troops who carry out these functions would also be participating in the enforcement of the immigration laws. Only in the event of an invasion or insurrection on US soil does the president have the power to order the use of the military within the United States. 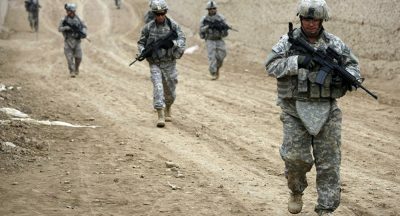 Indeed, “Military personnel are legally prohibited from engaging in immigration enforcement, and there is no emergency or cost-benefit analysis to justify this sudden deployment,” Shaw Drake, policy counsel for the ACLU Border Rights Center, said in a statement. Both the Nuremberg Principles and the Army Field Manuals create a duty to disobey unlawful orders. Members of Veterans For Peace are fanning out along the US/Mexico border from California to Texas in order to reach out to the troops that Trump has ordered to the border. Trump’s verbal attacks on the migrants and his deployment of troops to the border was a cynical ploy to help Republican candidates in the midterm elections. Although he mounted a consistent tirade against the “caravan” in the weeks leading up to the midterms, Trump has hardly mentioned it since November 6. He did cite it when he announced his new proclamation limiting asylum claims. Under the 1951 Refugee Convention, any person who arrives in the United States has the right to apply for asylum. Applicants must show they are unable or unwilling to return to their country of origin due to a well-founded fear of persecution on account of race, religion, nationality, membership in a particular social group, or political opinion. Yet Trump’s new proclamation would deny migrants the right to apply for asylum unless they entered the United States at a designated port of entry, which violates the 1951 Refugee Convention. The congress members called on Mattis to clarify the duration of the deployment, the number of troops deployed, the rules of engagement, what training troops have received, and how much the deployment will cost American taxpayers. Nearly 2,500 hopeful migrants have already arrived in Tijuana and thousands more are en route. Several organizations, including the National Lawyers Guild, have sent legal backup to the border. Members of Veterans For Peace are also at the border, offering support to troops who refuse unlawful orders to enforce the immigration laws. Trump’s border deployment order ends December 15. Pushback by individual Congress members is important. But Trump responds to negative publicity, so it is the mass mobilization of opposition that may cause him to back down. Marjorie Cohn is professor emerita at Thomas Jefferson School of Law, former president of the National Lawyers Guild, deputy secretary general of the International Association of Democratic Lawyers and an advisory board member of Veterans for Peace. Cohn, who has testified at military hearings and courts-martial about the duty to disobey unlawful orders, is co-author (with Kathleen Gilberd) of Rules of Disengagement: The Politics and Honor of Military Dissent. She is a frequent contributor to Global Research.